Laser drill. (No clarity enhanced filling.) Ideal cut. Traces of Hearts & Arrows (H&A). 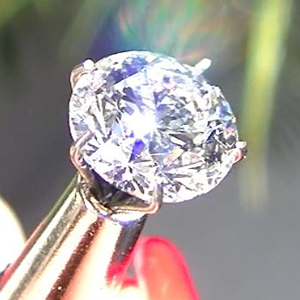 The diamond was fashioned with top level accuracy and craftsmanship. Exceptionally high levels of fire and sparkle are revealed. Diamond is white. 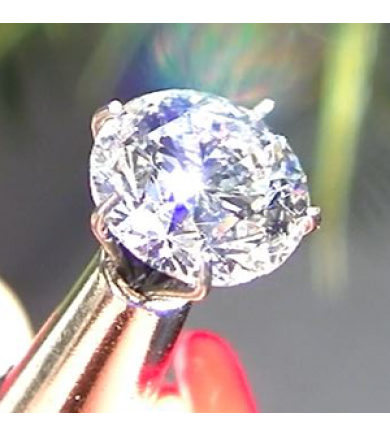 Diamond is clean when viewed by the unaided eye. Sarin Report Ratings / Brilliance: Excellent, Light Dispersion: Ideal, Scintillation: Excellent. According to the February 19, 2016 diamond price guide: Price for a non-laser drill, round brilliant cut diamond of this quality and size is: $22,624.